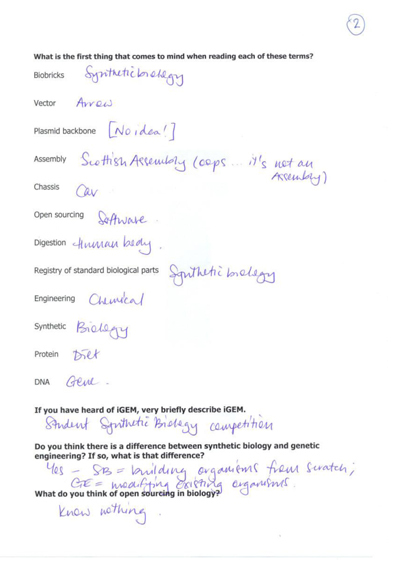 As part of our investigations into the communication of science we tasked ourselves with gathering a set of terms from synthetic biology, as well as a few questions to assess attitudes to open sourcing and awareness of synthetic biology. Below are the definitions of those terms we agreed upon. 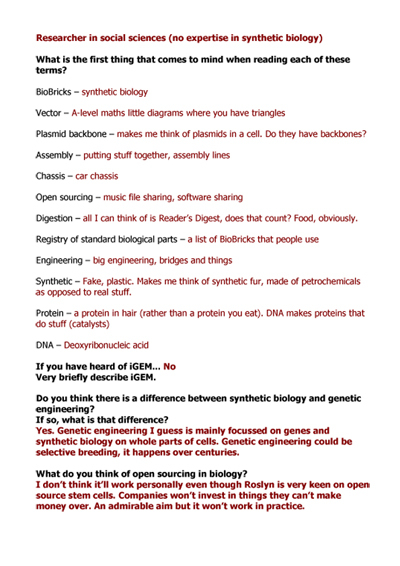 This discussion within the team, between engineers, biologists, informaticians, and a designer, was the start of analysing how easy it is for terms to be misunderstood. 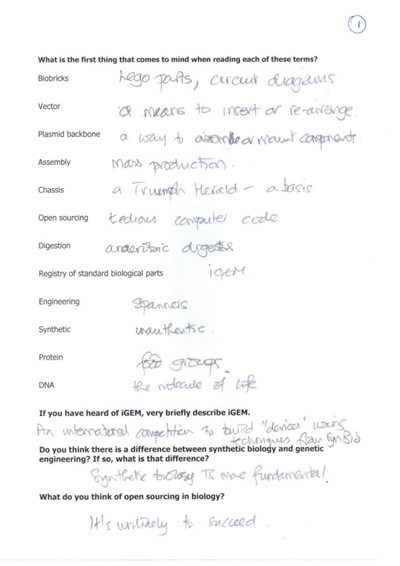 From this we gained an understanding of how each of us thought about these terms, and this idea was then extended outwards to the various disciplines involved in our team, from the team's peers to their lecturers, each with varying degrees of knowledge regarding iGEM and synthetic biology. More about communication of science can be found in the report. BioBricks – DNA sequence with defined structure, function and standardised ends for use in easy assembly. 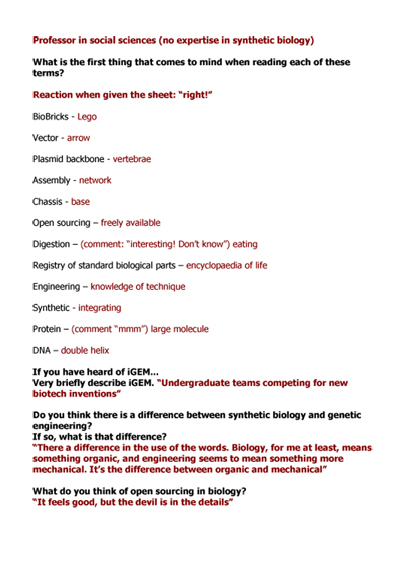 Vector – tool made of genetic material used to transfer foreign genetic material into a cell. Plasmid backbone – circular vector with selection marker capable of holding a DNA insert. Assembly – combination of parts to create a whole. Chassis – cell used to house and hold parts together, providing an environment for propagation and function. Open sourcing – Principle of access to source information and/or materials without obstacles of copyright or profit making. Digestion – process of chemically breaking down larger molecules into smaller parts. Registry of Standard Biological Parts – catalogue of Biobricks and their characterisation and categorisation information. Engineering – Practical application of scientific and mathematical principles. Synthetic – made through a process that alters naturally occurring material. Protein – molecule made from one or more amino acid chains with a specific 3D structure and function, made by and required for life. DNA - Deoxyribonucleic acid. No simple definition despite common beliefs eg. code of life. Contains chain made up of four bases of ACTG, the sequence of which can contain information. Below are some examples of some of the responses from this academic probe. 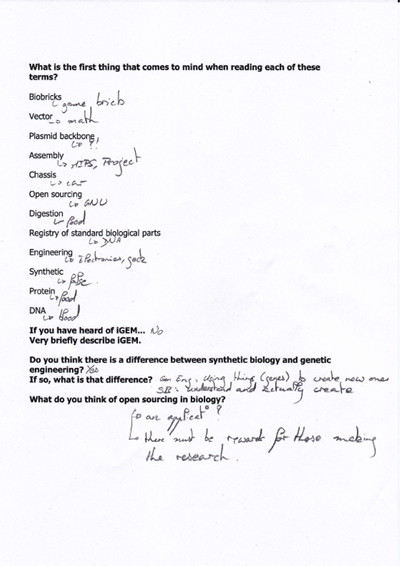 This questionnaire illustrates well the ambiguities that lie within the language of synthetic biology in particular and science in general. So it's not just being able to discuss science with the 'average Joe', it's about both the obvious jargon and also the subtleties of the meanings of terms used in various ways in different scientific fields. 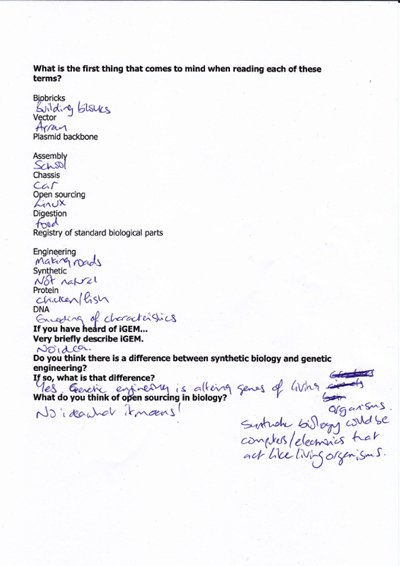 The questions still remain: how much do the non-professionals from a particular discipline need to know, how much can they really understand, and how much effort should be put in to help 'outsiders' comprehend the complexities involved in the practice of various scientific disciplines such as synthetic biology? Again, more about the problems in communicating in the language of science can be found in the report.